This is one of my favorite discoveries this season, and just in time for my holiday hot list. Yoko Ono's Grow Love with Me Plant is an awesome gift for anyone on your list this season. Because you can never have enough love, Yoko Ono designed this uplifting and magical bean plant for her friends at LongHouse. This cool bean seed has the word love etched on it. 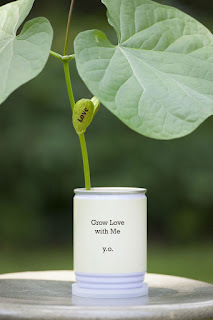 It comes in a recyclable aluminum can filled with soil, and your bean seed - the can is the perfect growing environment for your LOVEly new plant. Keep reading to learn more and be sure to head to their website to get a jump on your holiday shopping. The directions are simple and the plant is ready to go making this a perfect gift for youngsters and adults alike. 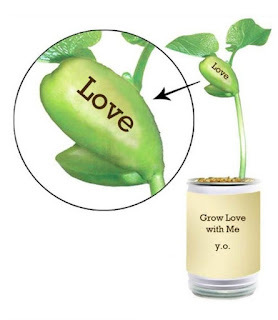 Following the easy to read instructions, your plant will start to grow in its can within 5-7 days. Once your bean sheds its brown shell, ½ reads the word “Love”, the other half is inscribed with a heart that has an arrow going through it. All this delightful bean on a vine requires is a minimum room temperature of 68 degrees and daylight so it’s ideal for those who are rarely home. 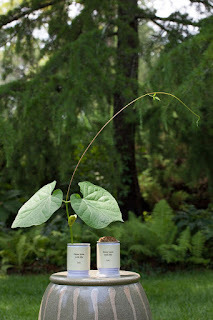 Once the plant gets larger you can transplant it to a larger pot and can even move it outdoors. Charming and inspiring, Grow Love with Me by Yoko Ono is a perfect and unique gift! This is an awesome stocking stuffer, is reasonable priced at only $15 and is perfect for both men & women. If you have a gardener or a want-to-be gardener on your shopping list - this is the perfect gift for them. Great for a boss, coworker, secret Santa, and any loved one.